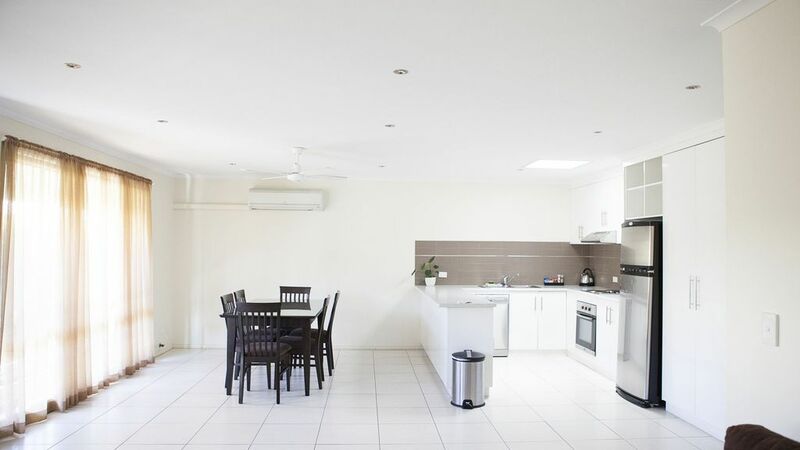 Enjoy the peace and quiet of being near the Murray, stroll into town for a coffee or breakfast, spacious villa's with everything you need and no hustle and bustle!! Why stay in a motel when you can enjoy all the comforts of home (and more!) for the same price or less? Check out Tripadvisor to see what our customers have to say about us! The property was listed as being wheelchair accessible but has a large step at every entrance and there was absolutely no way of getting the wheelchair anywhere near the shower or toilet! The few days that we were there were very cold and the heater was inadequate to cope with the drafts coming in under and around all the external doors. The bathroom had no heating and a fan that came on with the light, so my poor disabled aunt nearly froze while we were struggling to get her in and out of the shower. The single bed I slept in was like sleeping on a concrete slab. I believe that the photos and description of the property on homeaway are a false representation and the property is overpriced for its age and facilities. Overall it was a very disappointing experience! Couldn't be better, loved it! hope to stay again. Can't say enough about it. We stayed here for a weekend to attend a wedding. Checkin and checkout was seamless and the staff at the villas were so friendly and helpful! It was the perfect accomodation for a perfect weekend! We will definitely stay here again! !